For a variety of reasons, few litters are produced at Pyrmont but we are happy to refer enquirers to other New Zealand Kennel Club registered breeders of quality dogs. Pups do not leave us before 8 weeks of age and go only to approved homes. Pup owners will be asked to sign a contract. This will include spey/neuter arrangements. We supply all the care and dietary information for our pups, on-going follow-up advice, and if required, rehoming, and will assist owners who would like to show their dogs. We expect our pups to attend Puppy Preschool classes and recommend a basic obedience class at a NZKC training club. Our pups are fed a fresh food diet and we use homeopathic vaccines. We use natural remedies where possible, either instead of or in conjunction with, conventional veterinary treatments. It’s oh so easy to fall in love with the Pyr puppy. Common sense can fly out of the window as people exclaim “I WANT one”! But because of it’s size and independent nature, this breed is not for everyone. If you are considering buying a Pyr pup, it is absolutely essential that you understand what you are undertaking. Please read some of excellent information on the following websites. They discuss the suitability of this breed as a pet or working dog, choice of breeder, choice of puppy, bringing the puppy home, basic care and precautions relating to giant breeds, basic health care and possible health problems. 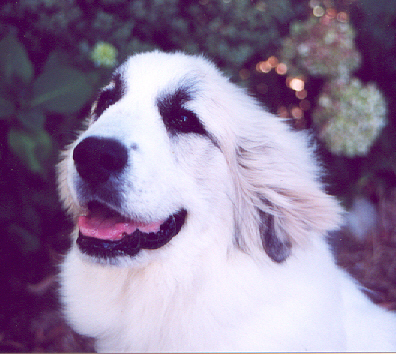 If you decide to buy a pyr pup, PLEASE buy from a reputable registered breeder who is prepared to supply references, show you his or her breeding stock and kennels and demonstrate qenuine knowledge and concern for the breed. Regardless of your country of residence, PLEASE do not buy from a breeder who wishes to remain anonymous and sells through a pet shop or other agent. puppy photo album pics of new pups currently displayed - more coming when time permits !